Why Are There Timeless Lessons That Do Not Get Arbitraged Away? We are pleased to write our sixth year-end letter to Euclidean’s limited partners. In this letter, we discuss Euclidean’s 2013 performance. We then reflect on important insights gained from adhering to our systematic approach to value investing during these early years. During the 12-month period ending December 31, 2013, Euclidean returned 44.8% after fees to investors. During this same period, the S&P 500’s Total Return (that is, the index return including dividends reinvested) was +32.4%. We ended the year with realized gains of $3.9M and unrealized gains of $16.8M. Unlike prior years when all realized gains were long-term in nature, approximately 94% of 2013’s realized gains were long-term. The balance in ordinary income comes primarily from two holdings that were acquired within our first year of ownership and were not entirely offset by short-term losses. Since we launched Euclidean, our process has returned +92.0% net of fees, while the S&P 500’s Total Return has been +61.5%. These gains translate into annualized compounded net returns of +12.8% and +9.3%, respectively. The limited amount of realized gains, when considered in light of the partnership’s significant increase in market value during 2013, reflects that certain positions we held at a loss at the end of last year ultimately recovered and that we are maintaining positions in which we have significant unrealized gains. We continue to hold shares in these appreciated companies because our models’ assessment of their fundamentals remains strong. We sold our previous company in 2006 after 10 years of hard work and deep learning about what makes a good business. Being part of the technology community during that period, which included the dot-com boom and bust, also opened our eyes to how fickle investor behavior can be. So, when we began thinking about how to manage our newly liquid assets, we wondered if there might be a sound way to invest that could be process-driven, protected from human behavioral swings, and grounded in timeless lessons for evaluating public companies as potential long-term investments. These musings set us on the path to launch Euclidean. Since then, and during the past five and a half years since we launched our fund, we have experienced in a high-resolution way the same things we consistently observed in the historical record — namely that the prices of companies’ shares are not always the same thing as the value of those shares. We have identified various causes for these recurring divergences between price and value, and they resemble what other value investors have written about for decades. Yet, despite the opportunity to profit from value-based principles, and the vast body of writings, research, and investment track records that support them, the opportunity to outperform by embracing these principles does not seem to have eroded over time. If you take an honest look at the history of public companies and their investment outcomes, you confront an unmistakable message about how various styles of investing have worked over time. Specifically, you note that strategies in which an investor buys shares in good companies surrounded by high pessimism (and therefore offered at low prices) bubble their way towards the top in terms of persistent, long-term performance. By adhering to these types of contrarian or “value-oriented” strategies, you would not have done well all of the time, but it seems that you would have done consistently well across long periods. How could it be that the strong performance of contrarian-style strategies persists over time? You would expect that as the secret got out, more would convert to this style of investing and gradually compete away the opportunity for excess returns. Yet, the secret has been out for a long time. Graham and Dodd wrote their seminal book on value investing 80 years ago. Since then, many studies have noted the persistent performance of value-oriented strategies, and the impressive track records of its practitioners have been impossible to ignore. Nonetheless, the opportunity to generate solid long-term investment returns from these types of strategies endures. This realization created big second-level questions. Why does this persistent opportunity to outperform via value/contrarian strategies exist? Why should we expect it to continue to exist? Our best answers to these questions have been found in research on behavioral finance and in our own reactions to the investment activity dictated by our systematic process. Market prices are established by people making investment choices. Market prices are therefore directly influenced by human behavior. Well, we humans have many increasingly well-understood biases and cognitive flaws that result in predictable errors in how we evaluate investment opportunities. We will discuss a few in a moment. But, that humans may be “predictably irrational” might not be very interesting. If individual investors behave in uncorrelated ways, then individual misjudgments might cancel each other out, resulting in an efficient, wisdom-of-the-crowd market where price and value rarely diverge. However, such an efficient market seems to be a thing of fantasy. It is not what we have observed in the historical record or encountered in practice during Euclidean’s first half-decade. Instead, we have witnessed that investors collectively, and repeatedly, focus on developments other than companies’ operating results. When investors do this, companies’ share prices and intrinsic values can materially diverge, creating opportunities to profit when price and value eventually reconvene. Therefore, of the many behavioral finance topics that explain why individual investors make bad decisions, we discuss a few that explain why investors often (mis)behave in the highly correlated manner required for great investment opportunities to emerge. "If a driver sees an equal total number of red cars as blue cars during a long journey, but there happens to be a glut of red cars at the end of the journey, they are likely to conclude there were more red cars than blue cars throughout the drive." Because recency bias is a fact of human nature, our default reaction is to over-respond to new information. When things are going well, we tend to expect them to continue going well. The flip side is also true. When good companies end up on the operating table for some reason (missing earnings estimates, a departing CEO, a failed product launch, a new regulation going through Congress, etc. ), investors often assume that, because things have gotten worse, they can only get worse. In this context, investors can become blind to the possibility that when a company is surrounded by pessimism, the company might adjust and operate in the future as well as or even better than it has in the past. This bias binds investors into groups. Investors live in the same market, read the same news, and have a common set of recent experiences that color how they interpret new situations. In 1999, most investors saw only the opportunity for profit. In early 2009, most saw only the opportunity for loss. These are a few simple examples of investors’ recency biases playing out in highly correlated lock step and the crowd’s collective action ultimately proving unwise. In these and many other instances (which often occur at the “micro” level of individual companies and industries), investor actions set market prices that materially diverge from the intrinsic value of individual companies’ shares. Recency bias is only one of many aspects of our mental wiring that have been refined and inherited from our ancestors. It is useful to examine the context in which humanity evolved to appreciate other ways we may be wired to collectively make bad investment choices. Humans have been evolving for at least 4 million years. Almost all of that time, humans lived in hunter-gatherer societies, where survival of the fittest meant being the best at navigating the day-to-day needs for food and protection. Only during the past 10,000 years, with the development of agriculture, have our ancestors lived in more complex societies where the ability to think long-term and plan for the future was an advantage. To appreciate the implication, reflect on an analogy offered by Peter Bavelin. Imagine that all of human evolution was compressed into a single 24-hour day. Consider that 23 hours and 55 minutes of this evolutionary day occurred while our ancestors were on the savanna, living moment to moment, scrounging for food and avoiding predators. Only in the past five minutes have we progressed to the point where we can settle, think longer term, and make the complex decisions that we are now confronted with every day. The qualities that were advantageous during the first 99% of humanity’s existence still mostly govern how we interpret the world around us. We are wired to make fast decisions, feel losses more acutely than gains, and follow the herd. After all, our own distant ancestors survived to reproduce our closer ancestors, because when everyone around them started running, they — without thinking — began running, too. Many of these behavioral traits are contrary to the long-term, contrarian mindset that allows one to profit from value-minded investment principles. The human mind is wired to respond to threats second by second, but the fortunes and misfortunes of companies play out over years. During the month- or quarter-long periods when no new fundamental information on a given company emerges, investors are still bombarded with price fluctuations, general news, economic forecasts, and others’ views. Human nature is to respond to this information. The idea that one should ignore it must sound preposterous to most investors, given how much time people spend looking at price trends, watching CNBC, and seeking “expert” forecasts. This is a major cause of what our research found persists across time, and what has driven Euclidean’s returns since inception. As investors search for a signal in the noise that surrounds the stock market, they often attribute too much meaning to and overreact to information that proves to have little to do with the long-term value of their investments. This frenetic response to current developments often causes prices to fluctuate widely around a company’s fundamental value. Time and again, it seems that this divergence between price and value becomes wide enough for Euclidean to invest with a reasonable margin of safety and, we believe, puts the probability of long-term success on our side. Being human and possessing the same mental wiring discussed above, it has been interesting to adhere to a systematic investment process that is unmoved by recency bias, unbound from experiencing time on a day-to-day basis, and uninfluenced by the crowd. We have often found, in retrospect, that our instincts — if they played a role in our investment process — would have been counterproductive. This humbling fact is well documented across the 100+ investments we have made since launching Euclidean. Our investment process used machine learning to acquire experience by digesting the operating results and investment outcomes of public companies going back 40 years. Now, when our process “likes” a company, it is because the company has an operating history and market price that resembles other companies from the past that turned out to be fruitful investments. In general, the opportunities where we have been most uncomfortable have turned out to be better investments than those where we were most confident. 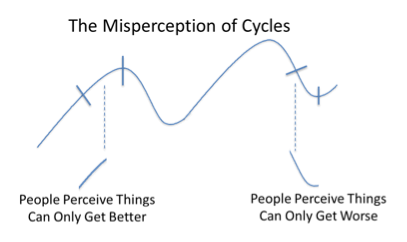 Even after living through a few cycles, seeing investors perpetually overreact to recent events, reading other value investors’ books, and seeing great support for value principles in the historical record, our best investments would often have been the most difficult ones for us to make had we been operating on our own, without a commitment to a systematic process. This is humbling, but it should not be surprising. We have the same recent experiences as others. We read the same newspapers. We have the same evolutionary history that has wired us to experience time and loss-aversion just as other people do. As a result, when great investment opportunities emerge because others’ pessimism is at a peak, it seems that our instinctive response would often have been the same as the herd’s, and be pessimistic as well. Our questions were the following: Why does this persistent opportunity to outperform via value/contrarian strategies exist? Why should it continue to exist? We have experienced the answers to our key questions in a very direct way as we observe the actions of others and in our own instinctive responses to Euclidean’s investment activity. Value investing depends on the opportunity to buy good businesses when they are offered at bargain prices. These opportunities have emerged in the past, and will continue to emerge in the future unless humans start acting in a very inhuman way — that is, if they patiently invest for the long-term and become immune to the day-to-day noise that has influenced investment activity across generations. We see no evidence that this evolution is occurring. We believe human nature is one constant we can count on persisting over time. Technology innovation will surprise us, industry structures will change, and regulations will evolve, but the basic elements of what it means to be human do not seem likely to go away. By continuing to search for persistent methods for exploiting how price and value diverge, and by embedding our findings in a repeatable process that is not influenced by human reactions, we are optimistic about Euclidean’s opportunity to deliver above-average results during the long-term periods ahead. Different measures tell different stories. The average return of our 18 realized positions was 12.3% in 2013 and 36.8% across all 82 realized positions since fund inception. The weighted average return of these realized positions was 1.4% in 2013 and 21.5% across all realized positions since fund inception. The measures differ because our returns have not been evenly distributed, we are not always able to establish full positions, and our fund has grown over time. This analogy is adapted and borrowed from Peter Bavelin’s book Seeking Wisdom, From Darwin to Munger. We provide this information because many of you have expressed an interest in talking through individual positions as a means of better understanding how our investment process seeks value. Previously, we disclosed our holdings as they were 45 days prior the end of each quarter. As Euclidean has grown in size, the SEC now requires us to make certain filings regarding our holdings as they stand at the end of each quarter. Going forward, to align with these filings, we are sharing information as of quarter-end. In last year’s second quarter, we wrote about our positions in the for-profit education industry. Although none of our ten largest positions were in this industry at year-end, 23.8% of our capital was invested across eight members of this industry as of December 31, 2013.